The best way to experience and explore the Danish heritage is by going to Roskilde. Join us for a tour where you will explore the magnificent cathedral – an architectural masterpiece. 1000 years of Danish history are gathered here under beautifully decorated vaults and in dark crypts. Here 39 kings and queens of Denmark lie buried and the cathedral is thus one of the most sacred places in Denmark. The cathedral is a UNESCO world heritage site. Afterwards we will visit the Viking Museum where original ships lay by the fjord. Your guide will tell you all the stories of the vikings. The Museum is the only place in the world where you can see 1000-year-old Viking ships, and then go directly out to the Museum harbour where the full-scale reconstructed Viking ships lie moored at the quayside. Would you like to take part in an unique sailing trip with a Viking ship? At this museum, you can! Lunch at Café Knarr at the Viking Museum, that serves new nordic viking food. Optional: Sail with a viking ship (€25) or have a new nordic viking meal in the museum restaurant before we head back to Copenhagen. If you want to know more about this tour or book it, you can contact us here: Contact us! 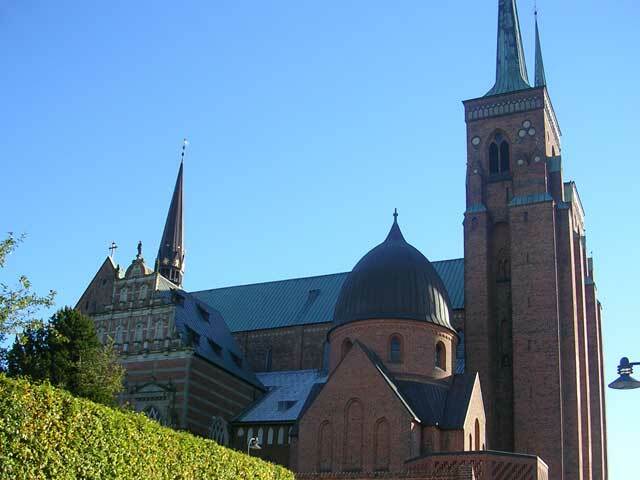 Built in the 12th and 13th centuries, this was Scandinavia’s first Gothic cathedral to be built of bricks. This style then spread throughout northern Europe. It has been the mausoleum of the Danish royal family since the 15th century. Porches and side chapels were added up to the end of the 19th century. Thus it provides a clear overview of the development of European religious architecture. In 2007 a crew of 65 brave men and women set sail on a journey from Roskilde to Dublin in a 30m (100ft) Viking longship named “Havhingsten fra Glendalough” (“Sea Stallion from Glendalough”). A Danish reconstruction of the Skuldelev 2 ship is on display in the Roskilde Viking Ship Museum and originally built around 1040 near Dublin. BBC TimeWatch follows this amazing journey of experimental maritime archaeology.